Visit Namibia? Why not! We decided to go; the others decided to head straight for St Helena. We had been told that checking out on a Sunday would be simple, a 20 minute process. Nothing is simple. For starters it was a half hour walk to where the authorities are. We got cleared by the port authority, and immigrations was next door and held no surprises. But customs was another matter. We had no paper clearing us in to Cape Town. Our clearance into Durban was of no interest. We couldn’t be cleared out of Cape Town without a clearance in. I asked the gentleman what I was to do, given that the yacht club had told us we were properly cleared in, yet we didn’t have the required paper. Well, we would have to clear in before we could clear out, and that would involve a fine for our delay, and on Sunday they don’t handle money so we would have to return tomorrow. We walked the half hour back to the yacht club, where Diane was helping us. She said this has not been a problem in the thirteen years she has been clearing yachts in and out. She got on the phone and insisted that we had to leave today, and a supervisor must call her back within the hour. It was a good effort, but the rules apparently had changed and Customs was not budging. Our fine was to be 1,500 Rand (a little over $100), and must be paid in the morning. So…what would happen if we simply left, I asked. Nothing. Our passports were already stamped. The next port would normally expect a clearance, which could be troublesome, but we could argue our case there. On Verra, our friends bound directly for Grenada (6-7 weeks away! ), had already given up and left. Diane offered that she would just go. We went. Today we begin Day 4 of this 700+ mile passage. Winds have been fresh, occasionally down to 15 or up to 35, but mostly in the low/mid 20’s. Almost directly behind us. The other boats (they also left when we did) have gradually worked their way west of us, but we still connect with them on our morning and evening radio net. The first evening we saw whales all around as the sun was setting. They were mostly in the distance, but just after Liam and I went below to sleep, Nora spied two crossing our bow. One dove just a few feet from the boat! Sorry, no photo. Today is also day-after-election-day. Both Nora and I sent in our ballots from Cape Town. Liam didn’t vote (ha ha, he’s British). I tried to get early results from Hallie via Sailmail before the end of my watch last night, but I forgot that the US had just ended daylight savings time. I was thinking the East Coast polls had just closed, when in fact they were still open, and I was dismayed that I had nothing from Hallie. This morning we still have nothing definitive, but it sounds like Trump is going to win. Wow. I really thought there was a “silent majority” that in the end would do what I considered the right thing. Like so many others assessing Trump’s chances, I was wrong. As I see it, the USAian voters first showed that they didn’t like the Republicans, and now show that they don’t like the Democrats either. Congress has earned that slap in the face, I think, but what a risk to hand more power to The Donald. I just wish we could see how the story of a Trump presidency plays out in the next episode, rather than dragging it out over four years. Back to Africa. The Namibian coast is low and flat, and the air off the desert creates a mist over the cold Benguela Current coming from the Antarctic region. So even though we have come within five miles of shore, we can barely make it out. And even though our latitude is now only 26 degrees south (Liam points out that this is the same distance south of the equator as Saudi Arabia is north of it), and summer is approaching here, it is COLD. No lounging on deck! Night watch in the pilot house under a blanket. And this coast is empty. No lights from shore; no airplanes; no chatter on the radio; no yachts; only an occasional ship; rarely even a cloud. 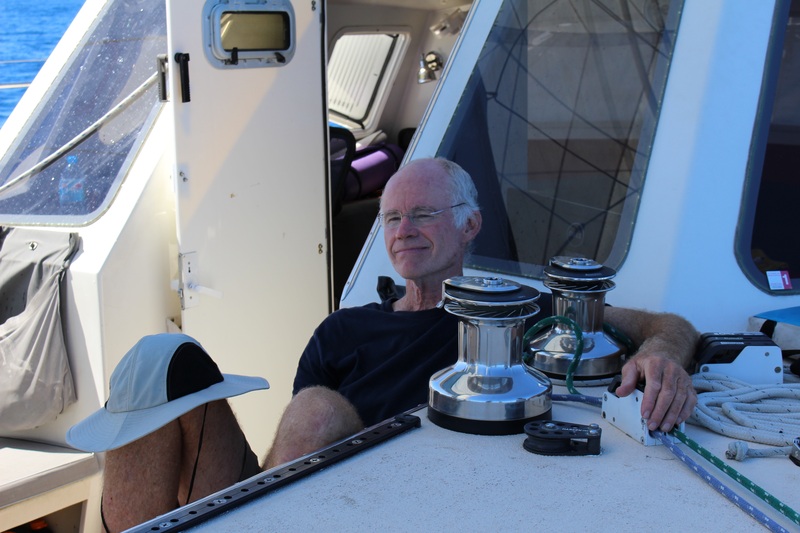 We are getting into the groove of 24 hour sailing…kind of wish we were settling in for a longer ocean passage, rather than stopping again and having to restart. Hopefully our Namibia adventure will prove worth it. We are trying to make it to Walvis Bay before dark tomorrow; it will be close. Made it. Not before dark. Exciting negotiating a busy unfamiliar harbor in the dark. But we found a mooring, and celebrated with a bottle of wine and a bar of chocolate. In the morning cleared customs (they didn’t even ask for a clearance from Cape Town), immigrations, found an ATM, found SIM cards and topped up data, got a map, and got wifi at the yacht club. Good start. Now we need to find someone to actually rent us a mooring (we don’t know who owns the one we’re on), and figure out how to rent a vehicle and where to go for some fun. Even the short video clips I take with my cell phone are usually too much for the Internet connections we have. But here is a link to a lengthy and high quality video posted on YouTube by Luc Callebaut, our BPO support rep in French Polynesia, covering some of our very delightful time in the Marquesas. Enjoy! 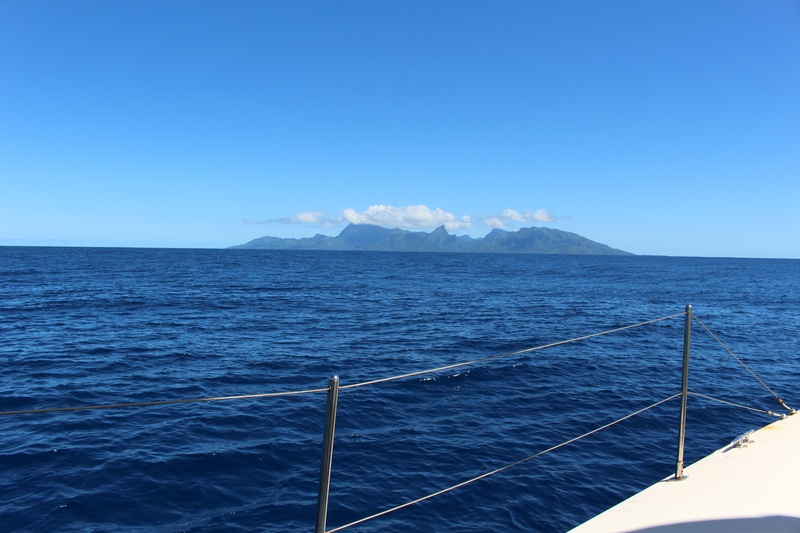 Glimpses of the island of Ua Pou in the Marquesas during the passage of the Blue Planet Odyssey rally in April 2015. 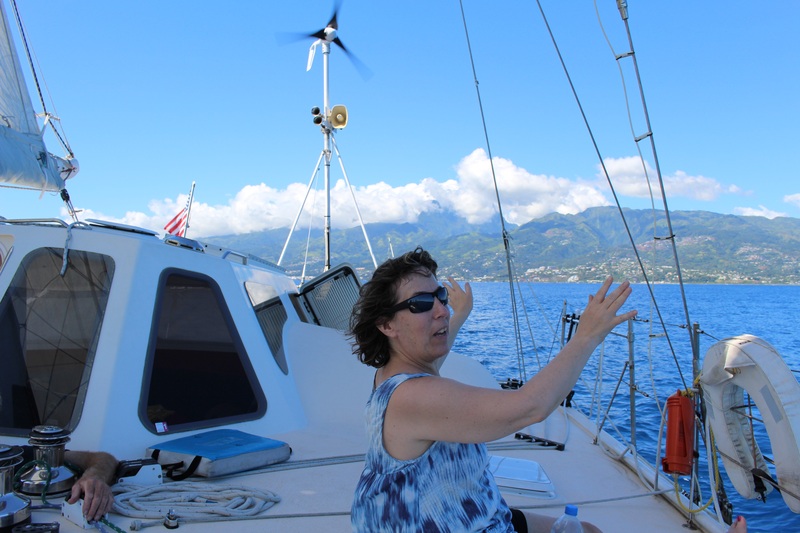 We spent nine days in the new marina in downtown Papeete. Hallie and I spent three of those nights in a B&B a short walk from the boat. It was interesting to see the apartment and speak with the owners, but I think we were happier when we moved aboard. Papeete was very convenient. Shops and restaurants and banks (everything is expensive, except baguettes), and the BPO reps Luc and Jackie helping with rides and phone calls and translation. We got our foresail patched and a zipper replaced on an awning. (And we ordered a new sail to be picked up in Australia.) We changed the oil in both engines and were able to dispose of the old oil. (We had been carrying old oil across the Pacific, waiting for a place to dispose it.) We had an electrician check our batteries and tell us they were okay. We rented a car so we could drive around the island, plus carry many hundreds of dollars worth of groceries to the boat. Last good place to shop until Australia, they say. There were several surprises in store for me in Tahiti. The first was that Jimmy did not declare the new/revised BPO route. He asked the participants what they wanted to do, and made suggestions. My second surprise was that the participants went out of their way to come up with a consensus plan. Everyone was flexible. And indeed, with Jimmy’s coaching about what routes/schedules work and what doesn’t, a consensus plan emerged. The BPO still has life after all. However, while many participants think the plan is ‘fast,’ I see it as ‘slow.’ I would like to sail more and visit places less, and return home sooner. The options are limited by the weather — particularly the cyclone season in the Indian Ocean. Either we have to sail aggressively to Australia and then to South Africa, which could get us home in one year, or else we follow the BPO plan (which now also goes to South Africa; the Red Sea is out), and see some marvelous places along the way, and get home in two years. There isn’t any middle ground. I’m on the fence about this. Since I expected the BPO to unravel, I was thinking of going fast on our own. With the BPO still alive, and the camaraderie of the participants, I’m now leaning toward the BPO plan (which, time-wise, is what I originally had planned). I probably haven’t written about all the crew in the BPO who have switched from one boat to another. There have been many shifts between boats. And in Papeete we learned that Bob Shanks, who had been crew on Maggie, was looking for a new berth. He asked Bill and me if we needed crew. At the time, the answer was, “Perhaps, after Australia.” It was later the same day that we got word that in fact we did need crew! (In retrospect it appears that Bob, and perhaps others, knew we would be wanting crew before Tim informed us; but Bob gave no hint of whatever knowledge he held in confidence.) In any case, by the next day we had signed Bob on through Australia. Bob is interested in continuing on after that, but we need a getting-to-know-each-other period, and we need to determine whether Tim will be rejoining or not. More to be said about these changes, and what the post-Australia plan will be…in another post. For my own blogging purposes, I’m considering this the start of Part 3 of the BPO. 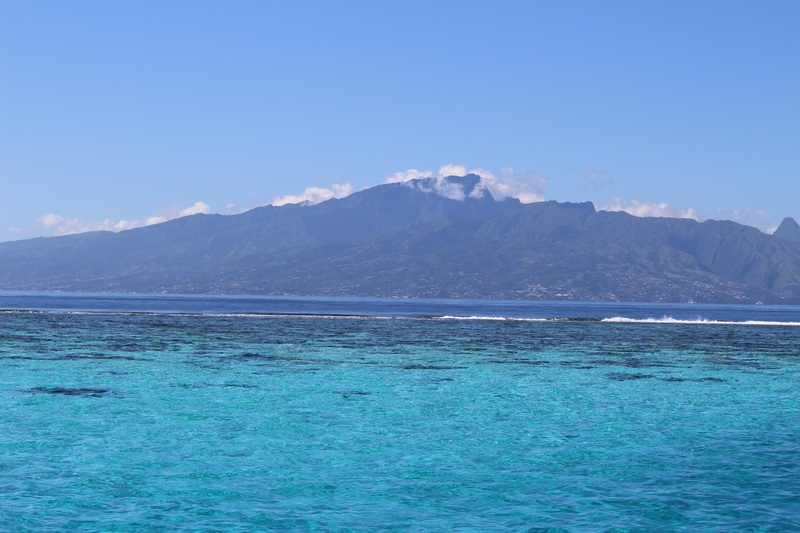 Yesterday we (Bill, Hallie and I) left Tahiti and sailed/motored the 10 miles or so to Mo’orea, where we could anchor out behind the reef, and get away from the city. That was a relief, but this anchorage leaves a lot to be desired, so we’ll get underway shortly to explore another part of the island. Hallie says goodbye to Tahiti. Bill says it’s great to be sailing again. Looking back at Tahiti from our anchorage in Mo’orea.